Journalist Flies Home To The Philippines To Face Arrest Warrant, Posts Bail Maria Ressa, the head of Rappler, an online news outlet known to criticize the Philippine government, was charged with tax evasion. "I will do what I need to do to face all of this," she said. 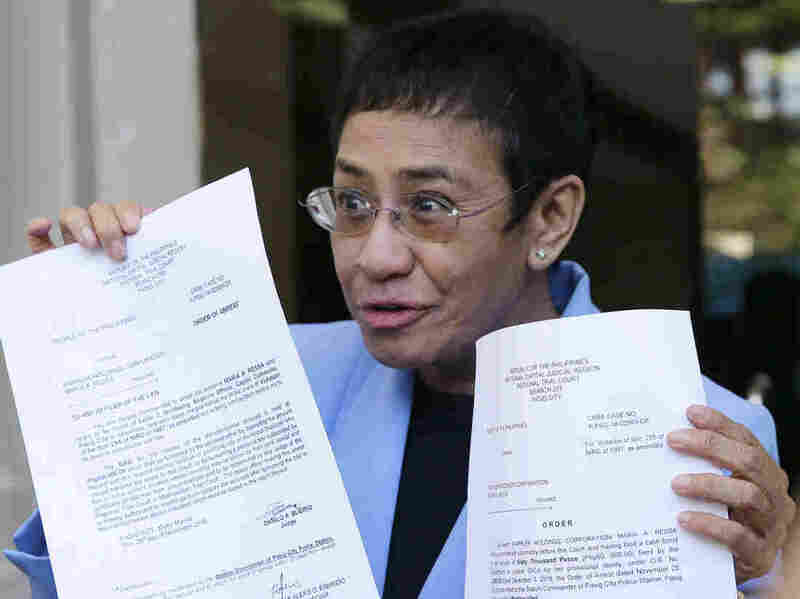 A vocal critic of the government of Philippine President Rodrigo Duterte, Maria Ressa declared her innocence after turning herself in to answer tax evasion charges. She posted bail at the court in Manila on Monday. A vocal critic of Philippine President Rodrigo Duterte posted bail on Monday, after returning to her country to face an arrest warrant and charges of tax violations. On Sunday night at Manila's international airport, Maria Ressa, the CEO and executive editor of digital news outlet Rappler, thanked reporters for showing up to cover the event. She had just returned from Washington, D.C., and New York, where she received the Knight International Journalism Award and the Gwen Ifill Press Freedom Award. Under Ressa's watch, Rappler has probed the extrajudicial killings committed in Duterte's war on drugs. The government charged Ressa and Rappler with five counts of tax violations in November. She faces a fine and up to 10 years in prison. "How do I feel about being arrested?" she told reporters in an airport terminal, as travelers rolled their suitcases by. "Well, number one, I'm going to hold my government accountable for publicly calling me a criminal." The arrest warrant "makes you feel vulnerable," she said. "But I think that's the point, right? The point is for the government to actually make you feel its power and that it can do what it wants to do, including bending the law to the point that it's broken." On Monday she posted a bail of 60,000 Philippine pesos (about $1,100) at the Pasig City Regional Trial Court, according to Rappler. "I surrendered to the court this morning, went through the process of what a criminal would go through, and filed bail without surrendering my right to question the Pasig court's jurisdiction over this tax case," she said. Authorities have conducted other investigations into the outlet and Ressa's work. In January, the Securities and Exchange Commission temporarily revoked Rappler's license for supposedly violating a law that prohibits foreign majority ownership of businesses in the Philippines. The Philippine Department of Justice also began investigating Ressa for alleged cyber libel. Ressa, a former CNN bureau chief, described the tax charges as "a clear case of harassment," adding that agents had been deployed to Rappler's office. According to Rappler, Ressa's arraignment is scheduled for Friday morning. The charges triggered condemnation from human rights organizations. "The Duterte administration is singling out one of its most potent critics with politically motivated charges," Nicholas Bequelin, Amnesty International's East and Southeast Asia regional director, said in a statement. "Rappler's fearless journalism has helped to expose the deadly reality of the so-called 'war on drugs' – and the thousands of unlawful killings of poor and marginalized people perpetrated in its name." Brad Adams, executive director of Human Rights Watch Asia Division, called the charges the latest example of the administration's contempt for free press, saying, "The Philippine government is targeting Rappler and Maria Ressa for their dogged reporting on Duterte's murderous 'drug war.' "
Shawn Crispin, senior Southeast Asia representative of the Committee to Protect Journalists, called for the "spurious charges" to be dropped "before any more damage is done to his administration's already threadbare credibility." Rappler launched in 2012, gaining praise for its 2017 "Impunity" series, which investigated killings in Duterte's drug sweep, and a series about propaganda, which examined how social media was exploited after Duterte was elected president. As his plans to eradicate drugs unfolded, Rappler's staff were among the government's first targets in 2016, Ressa told NPR this spring. "You can say I was blindsided by the fact that the government has used authoritarian tactics to try to control the narrative - the public narrative and to use a propaganda machine in a completely new way," she said. Staff reporter Pia Ranada was banned from Malacañang Palace, the president's residence and place of work, and she was attacked on social media. The president's trolls "say they wish death upon me," she told NPR. "They wish I get gang raped. They wish that they could do all kinds of really gross sexual assaults on me." In November, the impunity of officials in Duterte's drug war appeared to lapse: three police officers were found guilty of murdering a 17-year-old — the first convictions in Duterte's anti-drug campaign, NPR's Emily Sullivan reported.